The best way to protect your family and pets from fleas and ticks, is with outdoor flea and tick control services from Pleasant Green Grass. Ants, fleas and ticks can prevent your family from really enjoying time on your lawn. Pleasant Green Grass Lawn Care doesn’t want that to ever be the problem. That’s why we have developed a procedure that combines the use of EPA exempt and organic control products to help minimize and even prevent invasions of ants, fleas and ticks. And because we’re committed to 100% organic products, you can be sure that your family and the environment are safe. At Pleasant Green Grass, we are committed to the safety of your family and the environment. We understand that in order for your family to truly enjoy your yard, it must be free of pests like ants, fleas and ticks. What you may not know, what we understand, is that synthetic chemicals and pesticides are more dangerous. Pesticides linger in your lawn for months after their application, meaning you may be free of pests, but exposing yourself and your family to hazardous chemicals. Pleasant Green Grass uses only 100% organic products, so you can be sure your family is safe. Our organic products are still largely unregulated in the lawn care industry. Many companies claim to provide natural and organic products, but often provide products that contain synthetics. At Pleasant Green Grass, we believe that if it was developed in a laboratory, using synthetic products, it isn’t organic. We are committed to 100% organic products and techniques – no synthetics. Ants, fleas and ticks are a pest that can leave you trapped in your home instead of enjoying the great outdoors. But the hazardous chemicals in pesticides offer little more opportunity to safely enjoy your lawn. At Pleasant Green Grass we are committed to 100% organic products that provide your family the option to enjoy the outdoors without the pests or the chemicals. 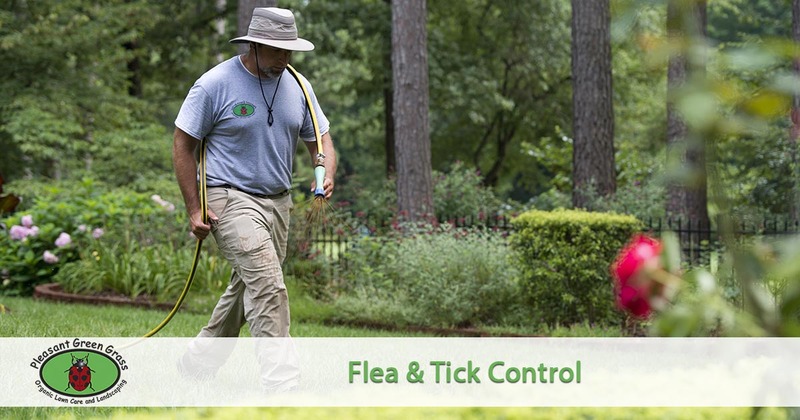 If you’re interested in learning more about our EPA exempt and organic control products and how they can help to prevent or control your ant, flea and tick problems, contact Pleasant Green Grass today. Your family, your home and your lawn matter. Have questions or need to schedule your flea and tick control services? Give Pleasant Green Grass a call today at 919-357-8245 or request a quote online.